Just like our beers our wines are ingredient driven. We strive to grow and source the finest ingredients so we can make and serve the finest wines. Garden Grove manages its own vineyard to ensure we use the highest quality wine grapes, located in the northern section of Virginia’s Blue Ridge Mountains near Delaplane, VA.
Our vineyard site was chosen because it is one of Virginia’s cooler vineyard area allowing for a long, slow ripening of the fruit. Intense flavors are developed and wonderful acidity is retained. Our ciders are crafted using the highest quality Virginia Gold Rush apples, a variety that has the acidity, and rustic flavors that we crave. Our Meads, Cysers, and Pyments are crafted using the best possible honey, apples, grapes, fruits, flowers, and herbs, many of which are grown by Garden Grove. 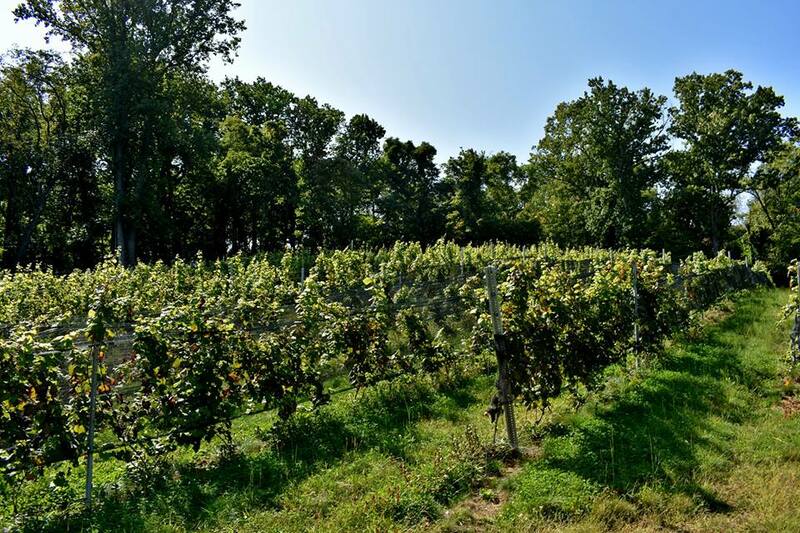 Our Petit Verdot and Chardonnay are made in collaboration with viticulturist and winemaker Jason Murray of Arterra Winery in Delaplane, VA. Those wines are made utilizing 100% native fermentation and are designed to showcase the character of the grapes. There is a focus on old world sensibilities to the wine making methodology while shying away from the new world winemaking techniques such as added enzymes, tannins, coloring agents or new oak. Our Ciders and meads are made simply, utilizing yeast that preserve fresh characters. We also frequently ferment our ciders and meads in wine barrels adding depth and complexity. It all starts with an understanding of what makes a great wine. Some of the best days of our lives have been spent searching for and discovering the great wines, ciders, and meads of the world. Tasting the great wines from producers that strive to capture the flavors that are naturally created in their region with grape or apple varieties that have been vetted and perfected over centuries is critical to understanding your own wines. Traveling to France to taste classic Bordeaux and Burgundies as well as Ciders from Calvados has provided the framework for our style. Our wines are inspired by old world sensibilities. That means wines that are food friendly, have refreshing acidity, and their flavors reflect where they are from and are not adulterated by the winemaker. We use a more new world and eclectic approach with our meads but still utilize ingredients grown in Virginia and do our best to let those uniquely Virginian flavors shine.